Ben Stiller stars in "The Secret Life of Walter Mitty"
The not-so-secretly talented Ben Stiller is at it again. “The Secret Life of Walter Mitty,” a remarkable tale about an average man, is the second film to adapt James Thurber's 1939 short story by the same name. Samuel Goldwyn, Jr., whose father produced the original in 1947, oversaw sixteen years of developmental changes before finally taking root in a partnership with 20thCentury Fox. Stiller, who directed "Zoolander" (2001) and "Tropic Thunder" (2008), landed both the lead role and director's honor. 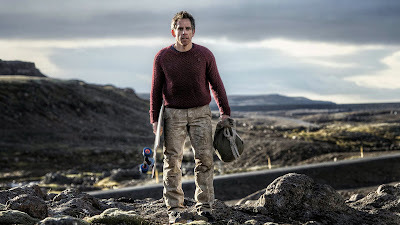 Walter Mitty (Ben Stiller) is an affable, unassuming career photojournalist at Life magazine. When the magazine announces that the future of Life is Life Online, an internet-only format that threatens a number of tenured values and employees, Walter, who processes the negatives of any photo Life publishes, begins to worry. When he realizes he can't find the negative planned for the final issue's cover photo, he starts to panic. His international journey to uncover the photo's whereabouts connects him with places he's never heard of, fears he's never faced, and a girl with whom he's never had the courage to flirt in person. Ben Stiller and Kristen Wiig in "The Secret Life of Walter Mitty"
By the time the opening credits conclude, Stiller's shot awareness is clear. A deliberate and seemingly effortless command of color, space, lines, and music creates an experience not unlike those offered by greats such as Wes Anderson or David Fincher. As not to compete with its visual power, the film's beginning is free of dialogue; the first sound is a webpage click. The second is audience laughter. Walter is exploring his recently hatched Internet dating profile in hopes that he'll catch his coworker Cheryl Melhoff's eye, but he can't seem to send a “wink.” Cheryl, played by Kristen Wiig (Saturday Night Live, “Bridesmaids”), is brand new to Life magazine and single parenting. Her interactions with Walter are naturally unnatural—the inherent awkwardness of blooming romance is palpable, and Walter has no hope of making it any easier. Their conversations (and his resulting daydreams) are some of the screenplay's most delicious highlights. Every aspect of “Walter Mitty” is current, from Life's online transition, to Walter's experience with eHarmony's customer service, to his run-in with an overprotective TSA. This continuity both helps and hurts; while the relevance lends generous humor and bolsters the frequent “been there, Walter” sentiment, it can interrupt the film's desired escape from now. Though Walter's phone ringing by some unfortunate miracle of cell reception in the middle of his Himalayan hike does accurately echo the fantastical theme. 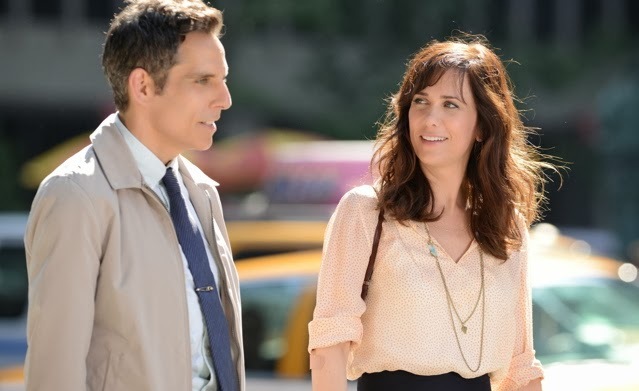 Ben Stiller in "The Secret Life of Walter Mitty"
Adventurous, brave, and creative, “The Secret Life of Walter Mitty” has everything Cheryl's eHarmony profile looks for in a movie—er, man. Stiller remains impossible to upstage, but the supporting performances play in his league at worst. Shirley Maclaine is exactly who you need her to be, earning your mental Mom of the Year award. Patton Oswalt makes an unexpected rescue. Adam Scott gives beards a bad name. And Sean Penn is, shall we say, the quintessence of a man crush. Shot in New York and Iceland, the panoramic landscapes are what stick with you weeks after watching. They'll repeat in your head while you happily hum the empowering soundtrack (courtesy of José Gonzalez, David Bowie, Of Monsters and Men, and others), and you won't realize you've zoned out Walter-style until your coworker asks why in the world you're attempting kickflips on your spinny chair.